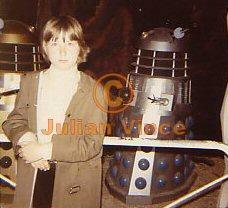 My earliest DALEK memory is from THE EVIL OF THE DALEKS. Some silver DALEKS glided out of a skip-container, and playfully chased the 2nd DOCTOR WHO around the room. Strangely, in real life, I was sharing in the experience. I had been given a LOUIS MARX robot DALEK, by my mum. Once activated, the silver plastic toy chased me around the living room floor, whirring and sparking, until I leapt onto the sofa to escape it. When I was little, DALEKS seemed like fun! 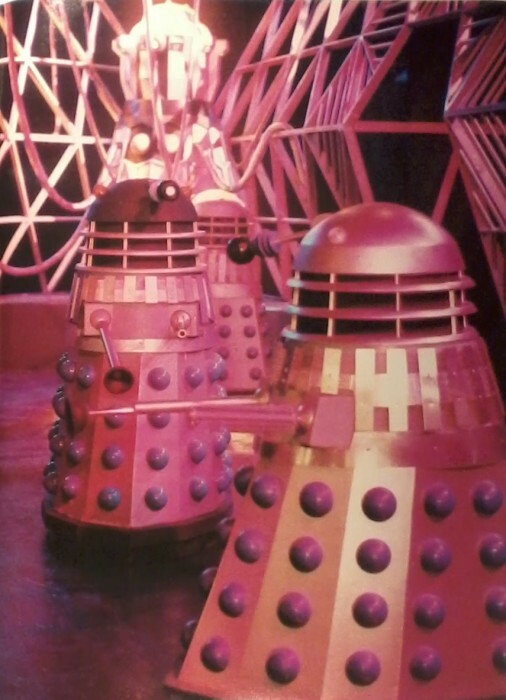 At round this time, a large magazine poster appeared, showing 3 DALEKS and the 2nd DOCTOR- in glorious COLOUR! It was still a black and white world back then in the 1960s. I had put the poster up on the wall, and the photo inspired me to endlessly draw pictures of DALEKS doing things! When I was small, DALEKS seemed to be long and tall, and covered in 'spots'. I might put up to eleven spots in each row when drawing them. It depended on how much space there was to fill in on these elongated robots. As I got older, I realised that they weren't half as spotty as I'd thought they were, so perhaps this marked the very beginning of my desire to make and own an accurate DALEK! When, in 1972, I went with my mum to see 'real ones' at the BBC Exhibition in London's SCIENCE MUSEUM, it was like meeting old friends. To me, they weren't scary, just intriguing. I was up close to these gleaming, moving, talking machines, and able to study them at close quarters, as if I were a kind of DAVID ATTENBOROUGH venturing into their world. Despite previously having 'been' a DALEK several years earlier, when I was still small enough to fit inside one of those 'Ride-inside' red & gold ones (which cost a shilling to operate), this was different. These two museum DALEKS gave me my first 'Close Encounter'. I felt I knew them well.